Have you seen Jupiter or Beteleguese in the night sky? Well I went out to take pictures of Jupiter and Betelgeuse in the night sky. I live in Maple, ON or where Canada’s wonderland is. The light pollution is still pretty bad I even had to darken the photo and then make the temperature cooler so that you could see the stars better. I just wanted to point out one star in particular Betelgeuse. Click the image to get a better look! So hopefully you can see the comparison of the two. 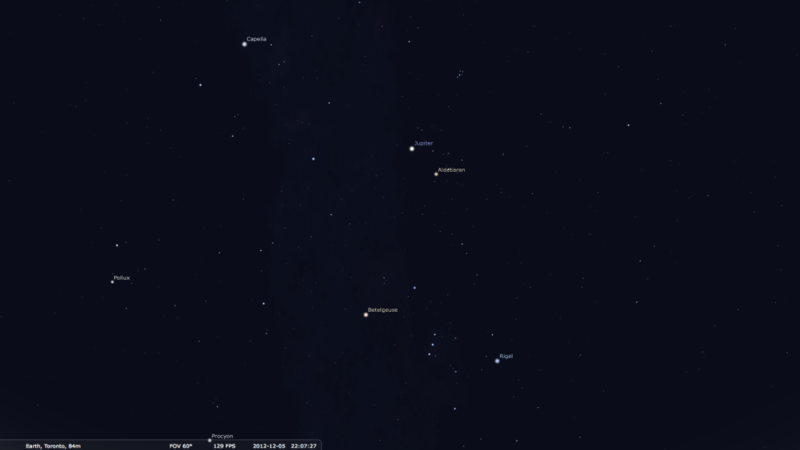 One I took of course and the other is from a free program I use on my Mac called Stellarium. You can see the cross in picture near the roof of the house that I took and you can compare it with this second one. Betelgeuse is on the left end of the cross. What’s so crazy about Betelgeuse is REALLY BIG. If it were in our solar system it would go PAST Jupiter! Now we know that from the Earth to the Sun (1 AU or 1 astronomical unit) is approximately 144 million km. Jupiter is 5 times that distance! So you can imagine that Betelgeuse is really really big! 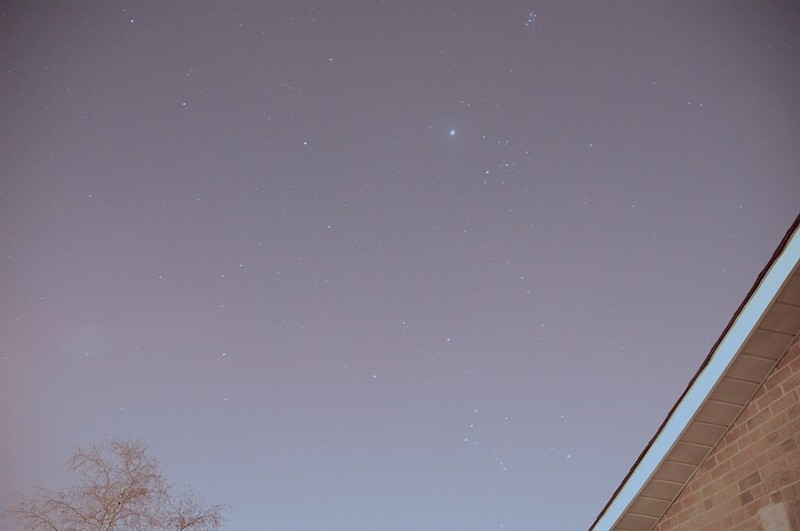 Now the really bright object in the sky at the top (the brightest) is our friend Jupiter. That’s all I wanted to share tonight. Also keep a look out on December 13-14th for the meteor shower. I’ll make another post more on that later. Keep looking up!